Pediasure - As Nutritious As It Claims? Pediasure is the product of Abbott Company which is in USA. The manufacturing unit is in Singapore. So the product is imported from Singapore. 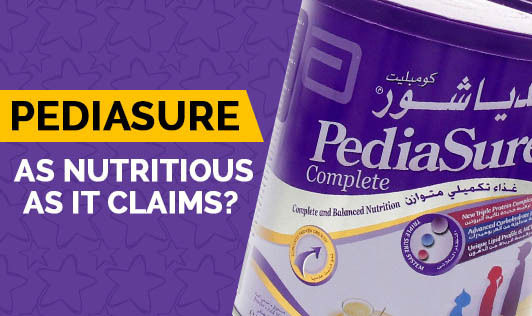 The product claims "Mothers around the world trust and use pediasure to fill nutrition gaps arising out of their child's fussy eating behavior. This trust is a result of pediasure superior product formulation with 37 vital nutrients fortified by Prebiotics and Probiotics and Choline and Taurine. PediaSure also meets 100% of the requirements * of vitamins and minerals for children above 2 years when consumed in adequate amounts." The calories for per 100g are 470 Kcal. Per serving as mentioned is 50g and it should be taken with water. But if you meet the marketing head of pediasure he will advise to take pediasure with milk. All of us have seen pediasure advertisement where a kid goes to school because of pediasure. Do you think a kid attends school just because of Pediasure? The product claims that it has all the essential nutrients i.e. complete balanced nutrition to grow taller and also make the kid go to school? For kids not only the physical growth but mental growth and activity growth also is necessary. Per bottle is 900g and costs Rs.760. This is pretty costly!!! Any other brand like bournvita/horlicks/complain also claims the same things but they cost from Rs.300-600 for 900g. 1.What's so special about pediasure? 2.What does adequate amount mean, when amount is already mentioned? 3.Why is it so costly? 4.Can a kid really drink 5 scoops (50g) of powdered water/milk? 5.Can this drink really replace a breakfast? 6.Will this product make children to get ready and go to school? 7.How would flavors play a significant role in growth? 8.Why take pediasure with water? I do not find any nutrient difference from any others brands. It is imported so it's costly? Can any child consume 50g of powder with milk/water at a time? Wouldn't it be heavy for digestion? Any liquid can't replace the nutrients of breakfast. Activity of child depends on food also but not on any supplement. There is nothing special about Pediasure. It's all the marketing skill of the medical representatives and we as customers fall for it. We love our children so want them to get the best and nutrition is no different. We fall for bad marketing and spend for it which it is not worth of. For the brain development of the kids the complex carbohydrates, DHA ((Docosahexaenoic acid) and omega 6 fatty acids are necessary. Pediasure has not mentioned if they are complex/simple carbohydrates. It doesn't contain DHA (Docosahexaenoic acid) and omega 6 fatty acids. Omega-3s help improve general brain functioning and restore memory. Foods high in Omega-3 include: fishes like salmon, mackerel, sardines, herring, as well as flaxseed oil and walnuts. Complex carbohydrates digest well, there by keeping the bowel movement of kids clear. Foods high in complex carbohydrates include whole cereals, pulses, peanuts, dried apricots, dried beans, yogurt, and oat bran. When you can find all the important nutrients in natural foods why buy a supplement? I am sure money is not the concern. But let your child learn eating natural foods than depending on supplements for its growth. Pediasure can just give height and weight growth which is a natural process in any child. Height or weight of a child not only depends on eating, but also depends on activity level, hormones, genes, birth weight etc. Give your kid the best and natural. Contact your dietitian to know more about the nutrition for your kids.